A beautiful piece from counter to table. 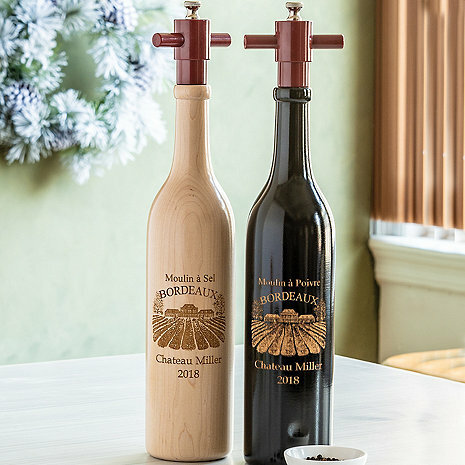 Chateau labeled grinders engraved with a name and vintage year of your choice. Pepper grinder fitted with adjustable cutlery grade stainless steel mechanism. Salt mill uses a corrosion resistant ceramic grinding mechanism. A fabulous counter-to-table mill, it's fitted with a cutlery grade stainless steel mechanism that adjusts to a full grind range from coarse to fine. Handsomely crafted from maple wood with an ebony finish, with burgundy top. **Please Note: Characters include letters, numbers, spaces and symbols. Apostrophe s is not automatically on this product. Font color, style, size or placement can not be changed. The word Chateau already comes included and can not be changed. It states that the word, "Chateau" is already included. I have listed, "Chateau Noblet." I'd prefer not to have the word, "Chateau" list twice! How should I word the first line? "Chateau Noblet" or "Noblet" assuming that "Chateau" will be preceding the name. BEST ANSWER: Doug, you do not have to include "Chateau" so in your case just "Noblet" will work. Chateau is automatically on the print. Chateau is automatically listed. Just put in the last name Noblet. I’ve ordered these 5 times as gifts. People love them. Beautifully done! My brother loved it as a gift. Would definitely recommend as a gift for someone or give to yourself! Bought it for myself. Love it! Great quality and beautiful carving. Would definitely buy it again for a gift. Would make a great wedding/anniversary gift for sure. Just a awesome gift to that culinary person, friend or family. My wife hit a home run with this one.